Empire State Building in New York - Observatory tickets. A well-known silhouette for Manhattan. This buildning you can´t miss, when it stick up between all the buildnings. Open 365 days a year. Fantastic view over the city! Take a trip up to the view point were you have a fantastic view over the areas of Manhattan and the harbour. The worlds tallest building for 42 years. 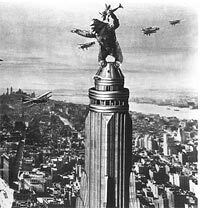 Empire State Building was built in March 1930 and was inaugurated May 1, 1931. The skyscraper have 102 floors and is 381 stories high (443,2 meter incl the spire and the radio tower). 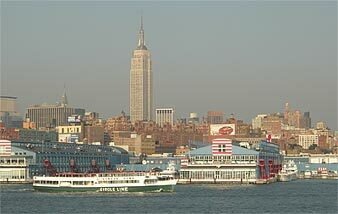 It has got it´s name from the nickname of the state of New York, that is called "The Empire State". For 42 years the Empire State Building was the tallest building in the world. It was when the first tower of the Twin Towers (World Trade Center - WTC) was ready in year 1973, that this titel could be picked down. WTC was 30 m higher. After WTC was exposed for a terror attack in Sept 11, 2001, Empire State Building again became the tallest building in New York but not the worlds tallest. The tallest building in the world today (2006) is Taipei 101 (Taipei Financial Center) and are situated in Taipei, Taiwan, who is 508 metre. Fantastic view from one of the film histories most famous building. Empire State Building is the given place to experience Manhattan from above. You will see the characteristic straight streets of Manhattan, the harbour with The Statue of Liberty and Ellis Island, Central Park and everything north etc. A fantastic view. Go up to the 86th floor! On the 86th floor, 320 meters up, you find the Empire State Building's Observatoy. Up here you get a panoramic view of Manhattan. You see all the way to the Statue of Liberty when you walk around on the outside. The observatory is one of New York's most popular attractions, and therefore it tends to be long queues in. Open every day, rain or shine. The skyscraper has been one of the worlds famous buildings due to all the movies it has been present in. Over 100 movies has it been and the most famous of them all is probably King Kong. The movie was filmed in 1933 directly after the building was done. It is on this building the giant gorilla climed to the top, gets attacked by aeroplanes and falls to the ground. A tradition of the Empire State Building in colors has been since 1976. And before that, in 1932 the first light from the top was a searchlight that reached 50 miles. This was a symbol of Franklin D. Roosevelt beeing elected president of America. Today the tradition continues and the building is full of colors. Different colors honors different events and holidays as: red/green/green for Christmas, blue/blue/white for the UN Day, all red for Valentine's Day and yellow/yellow/white for Easter. Now they want to repeat what they did 49 years ago. 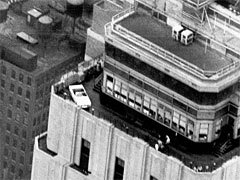 Place a car up on the observation deck (86 floor) at the Empire State Building! Hm ... how will they get a car up there? For 49 years ago the cut the car into three pieces and took the elevator up and mounted it up on the spot. The same is planned at this event ... even though the car is now wider and longer. The car is on the 86 floor: in 54 hours at 8 am to 2 pm. 16-17 April. 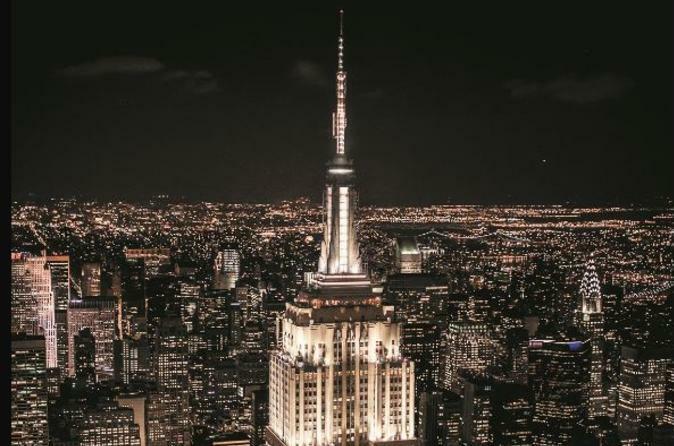 Exclusive: Empire State Building entrance and 3-course dinner! In this combination ticket you get admission to the Empire State Building Main deck (86th floor) and Top Deck (102nd floor). You also get skip-the-line to pass the long lines. Up here you get a great view over Manhattan in all directions. After your visit you will be served a 3-course dinner at the STATE Grill and Bar, located on the first floor of the Empire State Building. This combination ticket can only be booked through our supplier.